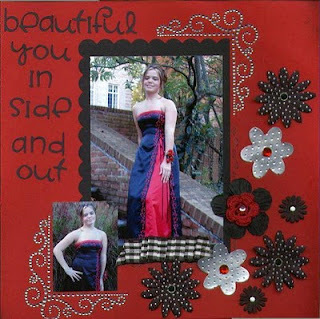 I have been scrapbooking for more than 10 years. My main goal has always been to preserve the present for the future and the past for the present in a creative way. The metal flowers were cut our of a pop can using my Sizzix. I then embossed them using my Cuttlebug. I punched a hole in the middle of the flowers and attached them using brads and glue dots. Wow, this is just dreamy. Congratulations on a well-deserved appointment to the design team. I'm so proud of you Joan!